Clocking in at less than 200 calories, these Salsa Verde Chicken Tacos are a delicious, light and easy dish that your family will love. It was a beautiful day Sunday, and my husband and I drove down to St Marks to explore the National Wildlife Refuge at the St Marks Lighthouse. This wonderful lighthouse was built in 1831 and is still standing after over 100 hurricanes and the civil war. The refuge was established in 1931 to provide a wintering habitat for migratory birds and is one of the oldest refuges in the country. It is a very picturesque area, and as you would expect at a wildlife refuge, we saw lots of wildlife including a bald eagle and at least, a dozen alligators sunning themselves. On the way down to the coast, we stopped for lunch at the Seinyard restaurant and had their yummy fried shrimp. All in all, it was a really nice day to be out and about. The point of all of this explanation is to say, when we got home, we were tired and had already had a very filling and heavy lunch so we wanted something light and quick for dinner. Jarred salsa verde and rotisserie chicken come together quickly to make these outstanding tasty tacos a perfect meal for when you have been on the go. Looking for other quick and easy southwestern recipes or recipes for Cinco de Mayo, check out my Avocado Lime Chicken Enchiladas, Taco Salad with Avocado Lime Sauce, and Tequila Lime Chicken Enchiladas. 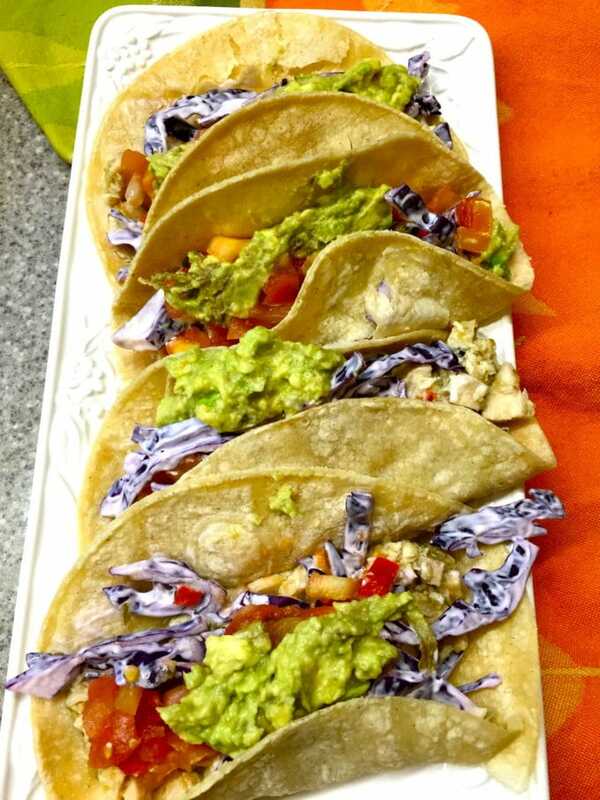 There are only a few ingredients which are cooked chicken, jarred salsa verde, purple cabbage, tortillas, an avocado, regular salsa or pico de gallo, lime juice, mayonnaise and salt to taste. 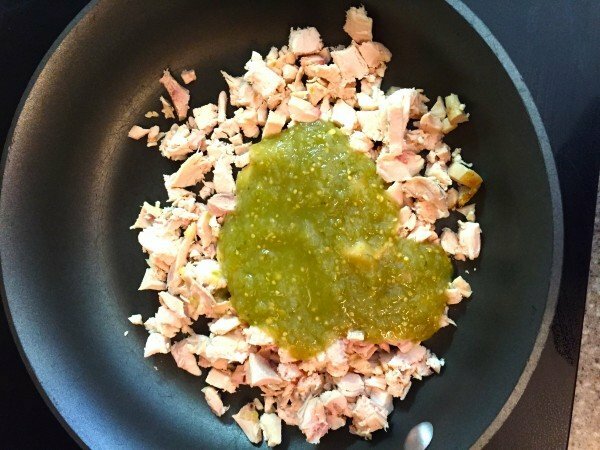 To make the filling, combine the shredded or cubed cooked chicken with the salsa verde in a small skillet over medium-low heat. Mix well and heat until the mixture is bubbly. Combine the shredded purple cabbage with mayonnaise in a small bowl and mix well. Remove the seed from the avocado and using a fork, mash the avocado in a small bowl until it is at your desired consistency. Add a teaspoon of lime juice and a sprinkle of salt to taste. This recipe calls for corn tortillas, but you can easily substitute flour tortillas. That’s the beauty of tacos; you can personalize them any way you like to satisfy your whims or to use whatever you already have in your pantry. To heat your tortillas, wrap two stacks of 4 tortillas each in packets of aluminum foil and put it in a pre-heated 350° oven for 15-20 minutes until heated through. Alternatively, you can also heat the tortillas in the microwave. To microwave them, put four tortillas on a microwavable plate and cover with a damp paper towel. Microwave in 30-second bursts until they are warmed through. Repeat for the next batch until all your tortillas are warm. To assemble, lay a tortilla on a plate. Add a generous spoonful of the chicken mixture, followed by a spoonful of the cabbage, top with some prepared salsa or pico de gallo, then a dollop of guacamole. Repeat with the rest of the tacos, or you can just let your family create their own tacos. Serve immediately and enjoy! If you liked the recipe above, please consider rating it and leaving a comment below. Also, follow me on Pinterest, Facebook, and Instagram. And finally, to receive new notifications of new posts by email, enter your email address in the Subscribe box. Thank you so much for visiting Grits and Pinecones! Delicious, healthy, quick and easy Salsa Verde Chicken Tacos are perfect for when you are short on time and motivation and perfect to serve for Cinco de Mayo! Remove the seed from the avocado and using a fork, mash the avocado in a small bowl until it is at your desired consistency. Add about a teaspoon of lime juice and a sprinkle of salt to taste. This recipe calls for corn tortillas, but you can easily substitute flour tortillas. 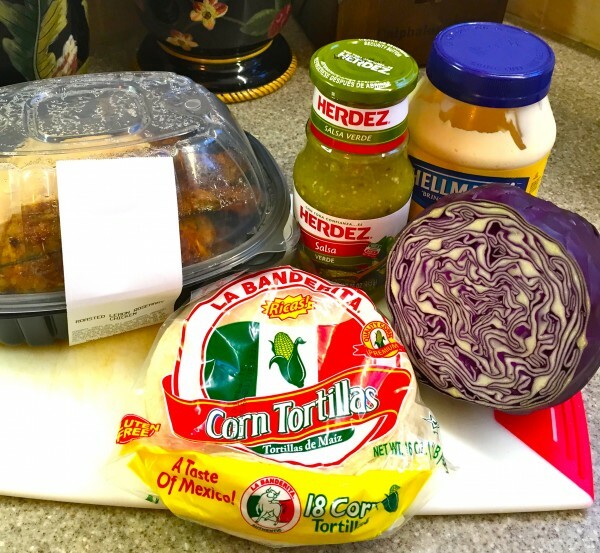 That's the beauty of tacos, you can personalize them any way you like to satisfy your whims or to use whatever you already have in your pantry. To heat your tortillas, wrap 2 stacks of 4 tortillas each in packets of aluminum foil and put it in a pre-heated 350° oven for 15-20 minutes until heated through. Alternatively, you can also heat the tortillas in the microwave. 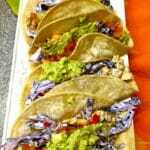 To microwave them, put 4 tortillas on a microwavable plate and cover with a damp paper towel. Microwave in 30-second bursts until they are warmed through. Repeat for the next batch until all your tortillas are warm. Thank you so much Anne! They are really, really good!